​A full range of high-capacity storage solutions with a variety of customisable fittings : Pyrox II from Fichet-Bauche includes single or double door models, all tested to resist fire for up to two hours. You understand that certain documentation such as legal documents and financial records cannot afford to be lost by your business and should not be left unprotected since there is always a risk that a fire could break out. You need a fire-resistant document protection cabinet that is built with the highest quality materials to secure your invaluable documents. But you also look for a solution that provides modern design that blend nicely into your office configuration. 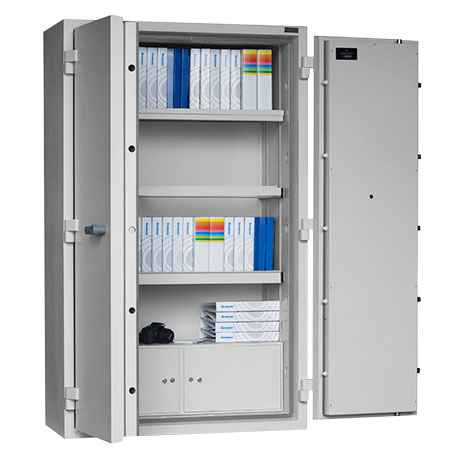 Pyrox II from Fichet-Bauche is a range of document protection cabinets that provides fire protection for up to two hours certified by UL (Underwriter’s Laboratories)according to Standard 72 Class 350. Pyrox II is perfectly suitable for office environment and offers functional, ergonomic and innovative design which can adapt into your space environment.